Do you own a rental home? Have you considered hiring property management? 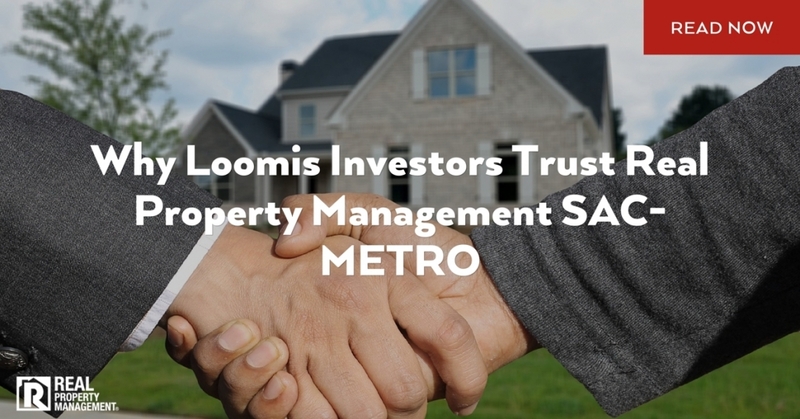 Loomis investors trust Real Property Management SAC-METRO to safeguard their investment properties and bring them a better return. Being a landlord is more than a full-time job. You can’t take off nights, weekends, or even holidays. Tenant trouble or emergency maintenance repairs can come at any point in time. Our qualified Loomis property management team can take the stress and worry out of being an investor. Property management is no simple job. A rental business can turn into a nightmare when properties are not managed properly. Not to mention, a homeowner can lose a lot of money if local, state, and federal laws and regulations are not followed. The professionals at Real Property Management SAC-METRO know the rental industry and how to best avoid any potential legal pitfalls. Our comprehensive list of services extends far beyond collecting a rent check. We use a tried and proven process to make investing in rental properties a successful business venture. We take over all the responsibilities of being an everyday landlord such as marketing, tenant-screening, home inspections, tenant complaints, maintenance repairs, and evictions. Real Property Management SAC-METRO is a trusted leader in property management. Loomis investors have a positive experience when working with our knowledgeable and highly trained experts. Our services will surpass your expectations. If you are hoping to increase your cash flow, we know how. If you are searching for someone to oversee the marketing and showing of your rental home, our professionals can do that. If you are looking to leave behind the daily duties of tenant communication and midnight emergencies, we undertake those responsibilities and more. Let us help you be successful. Give us a call today!